This single storey home with its simple 110sqm size doesn't mean that the home needs to be neglected in terms of splendid décor and design. In fact, there is a lot that can be done to make use of the floor size efficiently and effectively, even allowing this home to look larger than it is! As a result of the size, the home is an excellent and cost effective means of modern living, suitable for a small family. 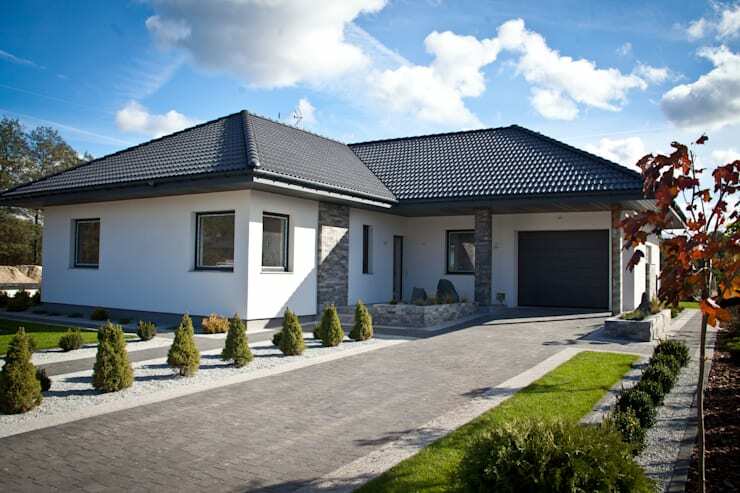 Situated in Poland and fantastically designed by the expert team at Biuro Projektowe MTM Styl, this home doesn't leave anything to be desired, with each room and living space carefully designed and planned to make it perfect and elegant. A home such as this allows for the finer things in life to be enjoyed… such as family time. The initial view of the main facade is simple, modern with a touch of traditional style and tasteful elegance and class. The all-white walls adds a touch of simplicity, while the natural stone pillars and additions to the facade add a traditional element. The darker roof tiles create a modern and simplistic effect, while the surrounding garden adds some enchantment and green splendour, necessary in any home environment. The exterior design of this home allows the building to look larger than it is. The home has an appealing quality that is further emphasised by the neutral tones used in the exterior, allowing it to look uncluttered and contemporary, without losing any qualities necessary in any home space, while the abundance of windows allows for natural sunlight to enter the home throughout the day. For more exterior home ideas from homify, have a look at these inspirational and decorative designs. From this angle we catch a glimpse of the stunning modern kitchen and simple yet elegant fine dining room space, which provides a balance to the all-white tone used in the kitchen area, adding in a darker black tone to create a yin and yang effect. In smaller homes such as this, it is usually idea to make the kitchen, dining and living areas into an open plan living space. Utilising this design tip, creates a larger area and doesn't separate and cut areas off from each other will almost make a home look more claustrophobic and compacted. The pure minimalism and modernism of this home is evident in this absolutely stunning living space which allows for neutral wooden tones to merge with the all-white walls for a comfortable and natural sunlight loving open plan interior of this stylish single storey home. Who wouldn’t find this dining room and kitchen area divine? 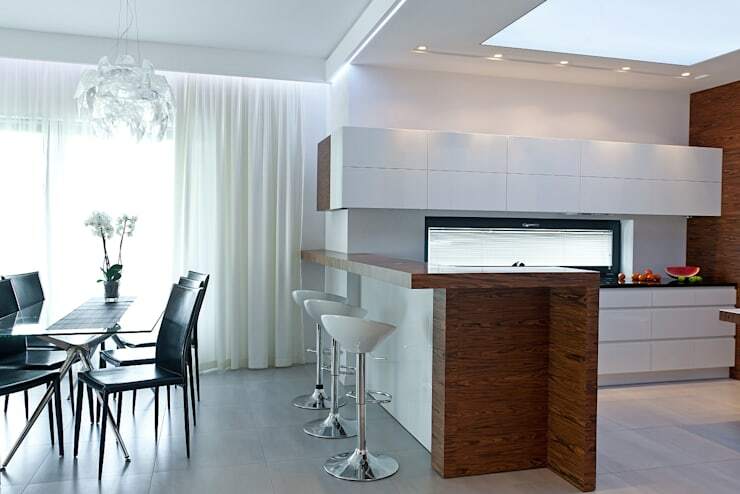 This modern kitchen seemingly merges all-white minimalism with a touch of wooden element along the wall that creates a more individualistic charm, something a lot more characteristic of the home owner or inhabitant. The addition of this natural aspects creates a softer touch to the stark all-white kitchen, while the use of white from ceiling, to the polished cabinets and the floor allows the space to seem more spacious. The L-shape of the spectacular gourmet cooking area has a small seating area against the wall, while ample counter space has been included for food preparation. With more than enough storage space in the minimalist kitchen cabinets included in the area. This area is exceptionally well lit with enough spotlights for night time use and a magnificent skylight to allow the light to pour in throughout the day, really opening the kitchen up to the heavens too! 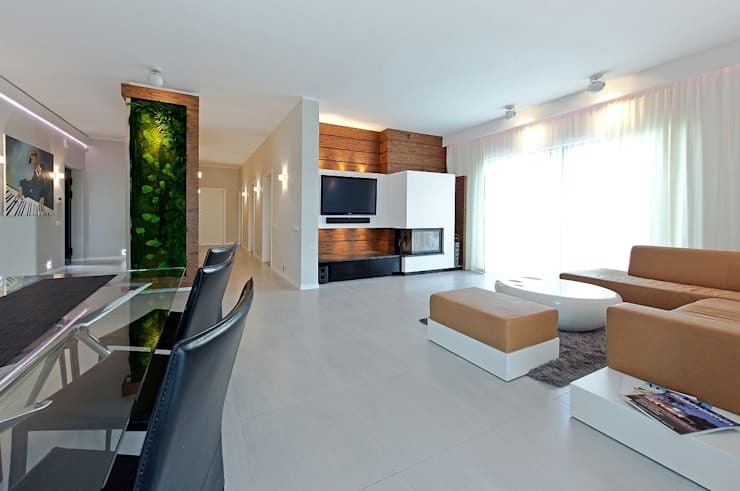 This open plan living space has a rather different element to it with the addition of the stunning vertical garden as an attraction, it also brings another colour to the neutral open plan living space, which brings a taste of the outdoors into this stylish home. The addition of the green element, adds an almost eco-friendly and environmental perspective into the interior of the home. From this angle we get an idea of what the living room area of the home looks like, it takes on similar tones as was seen in the kitchen, with the all-white cabinet and natural wooden element. While the large window next to the TV area allows for natural sunlight to be a staple part of the living room décor. For more home technology inspiration, check out: Behold! The High-Tech Home. This side view of the living room space allows the comfortable coffee toned L-shape sofa to be admired in full splendour. The relaxing space of the room allows for maximum time to just sit back and enjoy a good cup of tea and watch your favourite show in the evening, while curled up on the couch. Or if TV isn't your thing and you prefer to read a good book, this may be the perfect spot for that too! The all-white walls and curtains as well as the floors, almost make the living space appear larger and more open. While the walls are lined with enough lights that allows for a wonderfully lit home in the evening, but with enough stunning lights to add an almost brilliant illumination to the all-white painted room. Modern and minimalist decor works well together here, making for a comfortable and airy open plan living space. This creative bathroom has a grand element, making it fresh and fun with an Italian shower with glass partition, the orchid mural adds a gentle yet colourful touch, making this bathroom space seem even more serene and tranquil. While the addition of the white and wooden element adds the same peaceful setting that was seen in the rest of the home, merging modern minimalist and vintage elements to create a comforting and relaxing luxury bathroom. Combining all the elements and balancing them with the darker walls allows for an open and well-lit bathroom, while the large mirror along the wall of this perfectly placed and well-designed space creates the illusion of a larger more open and luxurious bathroom. 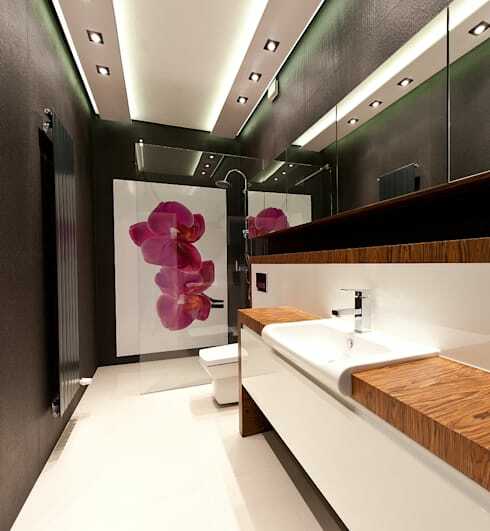 A splendid washroom such as this, fits in well with the rest of this modern and minimalist home perfectly! Extracting elements from around the home and incorporating it into this stylish one storey home! 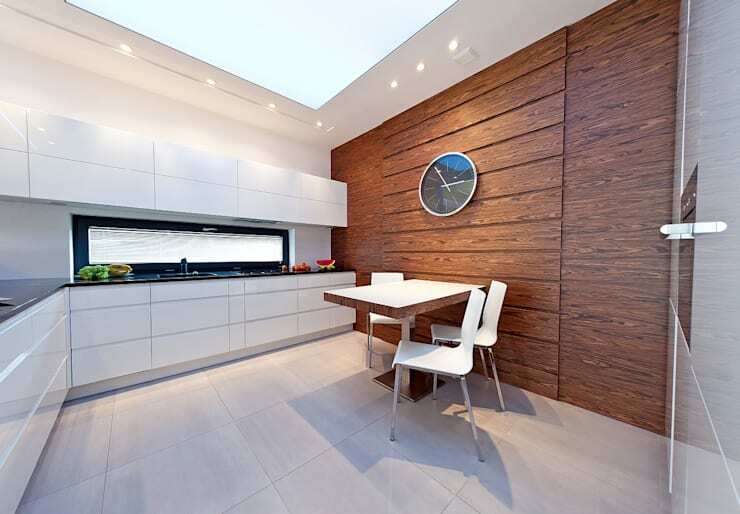 What did you think about this stylish and modern single storey?